43 Commonwealth is located on the north side of Commonwealth, between Berkeley and Clarendon, with 41 Commonwealth to the east and 45-47 Commonwealth to the west. 43 Commonwealth was designed by architect Julius A. Schweinfurth and built in 1902 for Ashton Rollins Willard and his wife, Agnes (Fairbanks) Willard. They previously had lived at 340 Commonwealth. It replaced a townhouse built ca. 1869 which the Willards purchased on March 1, 1902. Click here for an index to the deeds for 43 Commonwealth. Ashton Willard was a lawyer and art historian, author of several books on Italian art. Agnes Willard died in March of 1910. Ashton Willard continued to live at 43 Commonwealth with their daughter, Theodora Willard, and his sister, Mary Willard. Ashton Willard died in October of 1918. 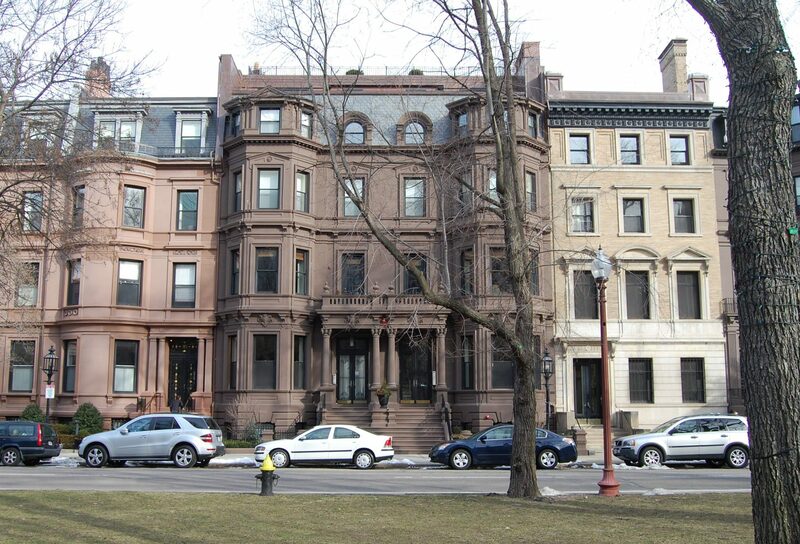 His sister and his daughter continued to live at 43 Commonwealth until 1922. On July 14, 1922, 43 Commonwealth was purchased from Theodora Willard by Mabel (Rothschild) Rosenthal, the wife of leather and wool merchant Louis Rosenthal. They had lived at 261 Clarendon in 1921 and in Beverly earlier in 1922. Prior to moving to 43 Commonwealth, the Rosenthals had the interior remodeled by architects Bigelow and Wadsworth. Plans for the remodeling are included in the City of Boston Blueprints Collection in the Boston Public Library’s Arts Department (reference BIN G-49). 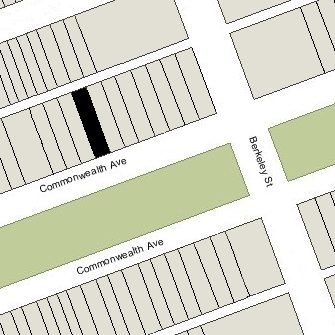 The Rosenthals continued to live at 43 Commonwealth until about 1947. On April 7, 1948, 43 Commonwealth was purchased from the Rosenthals, by Michael (Max) Lilly, a partner in the Lilly Construction Company with his father, Harry Lilly, and brother, David Lilly. Michael Lilly and his wife, Goldie Gertrude (Karess) Lilly, lived at 215 Newbury. In 1948, he converted 43 Commonwealth into six apartments. 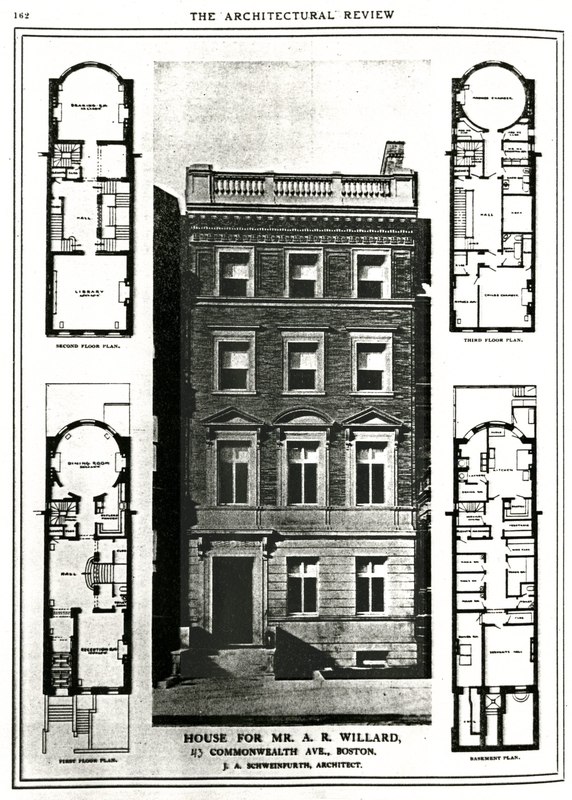 Plans for the remodeling, prepared by architect Clark F. Merrick, are included in the City of Boston Clueprints Collection in the Boston Public Library’s Arts Department (reference BIN R-88). On January 17, 1949, Michael Lilly transferred 43 Commonwealth to the Lilly Realty Company. It continued to hold the property until September 26, 1958, when it transferred the property to Michael Lilly’s brother and business partner, David Lilly. The property changed hands, remaining an apartment house, and was acquired on September 15, 1971, by James H. Currens, trustee of the 61 Mt. Vernon Street Trust. 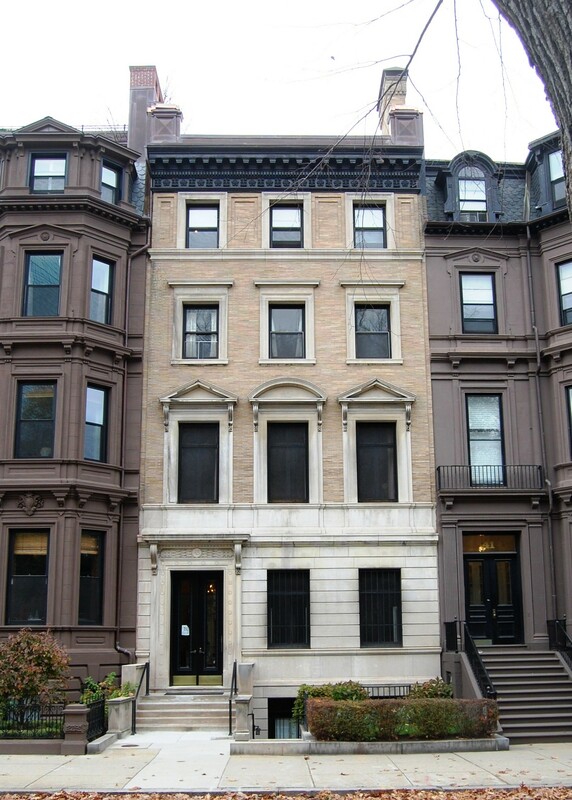 On January 4, 1974, James Currens converted 43 Commonwealth into six condominium units: the 43 Commonwealth Avenue Condominium. On May 1, 1974, before the units had been sold, James Currens reduced the number of units to five, reflecting consolidation of the units on the basement level. The original townhouse at 43 Commonwealth was built ca. 1869. It was one of four contiguous houses (41-43-45-47 Commonwealth) built at the same time as two symmetrical pairs, and one of ten contiguous houses (29-31-33-35-37-39-41-43-45-47 Commonwealth) built in the same design between 1863 and 1873. 41-47 Commonwealth were built for lumber merchant, real estate investor, and banker Elijah Chesley Drew and his wife, Hannah (Haines) Drew. They made 41 Commonwealth their home, and sold the other three houses. On August 20, 1869, 43 Commonwealth was purchased from Elijah Drew by William T. Andrews, trustee for the benefit of his daughter, Elizabeth Weld (Andrews) Clark, the wife of wholesale crockery dealer John Taylor Clark. The Clarks made 43 Commonwealth their home. They previously had lived at 2 West Cedar. 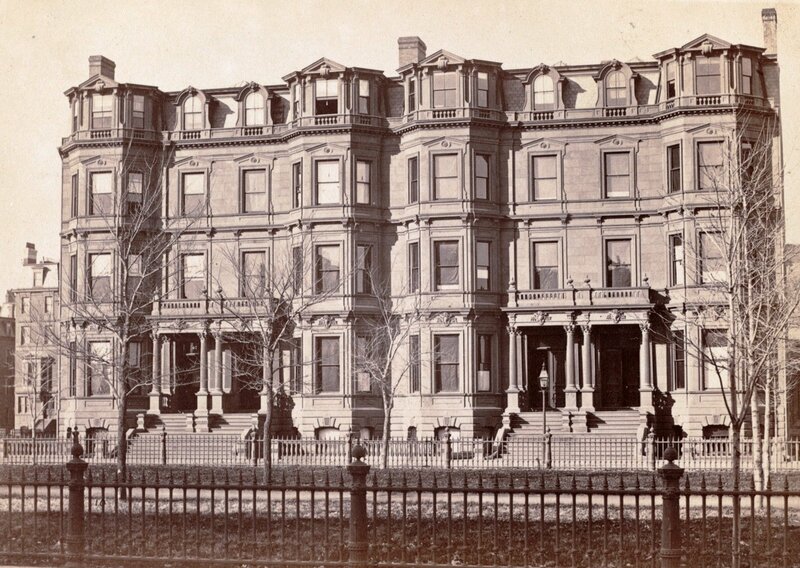 They continued to live at 43 Commonwealth in 1878, but had moved to Savin Hill in Dorchester by 1879. By the 1878-1879 winter season, 43 Commonwealth was the home of shoe manufacturer Harold W. Windram and his wife, Adelaide (Snow) Windram. They had been married in March of 1878, and 43 Commonwealth may have been their first home together. They continued to live there in 1880, but moved soon thereafter to the Hotel Vendôme. On August 25, 1880, 43 Commonwealth was purchased from Edward Ingersoll Browne, successor trustee for the benefit of Elizabeth Clark, by molasses and syrup dealer Irving O. Whiting. He and his wife, Angeline Geraldine (Grafton) Whiting, made it their home. They previously lived at 198 Dartmouth. Daniel G. Grafton, Angeline Grafton’s father, lived with them until his death in December of 1889. Irving Whiting died in December of 1901, and on March 1, 1902, 43 Commonwealth was purchased from his estate by Ashton and Agnes (Fairbanks) Willard, who demolished it and built their new home in its place.